Large striking area with tightmesh, no bugs or flies can escape.Soft but thick plastic material which makesswatters very durable and sturdy.Our flexible plastic won't scratch yoursurfaces. Stores easily in desk, Table, andCounter drawers. Contoured handle for a secure, comfortable hold. Eliminates flies,mosquitoes, and other flying insects. Large plastic head reduces misses.Ourflexible plastic won't scratch your surfaces.The kitchen good helper, fast kills the flies. A great addition to anyhousehold.Great for camping, picnics and other outdoor activities.Features astrong flexible square plastic screen on an extendable metal handle with foamgrip. Eco-friendly, non-toxic andodorless, harmless to your health.Fly swatters are an excellent alternative toharmful pesticides. Warranty: 30 days money-back & 12-months warranty, BUY WITH CONFIDENCE. 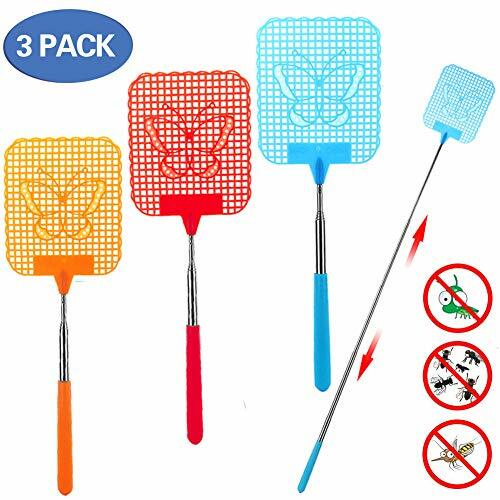 ✦AGGRESSIVE DESIGN✦The fly swatter features a strong flexible square plastic screen on an extendable rubber handle with foam grip.The metal wire of the handle is strong enough to stand up to a good swing and hard swat. ✦EASY TO STORAGE✦Lightweight and easy to use & storage. Good flexibility ,these fly swatters are small enough to stick in your car. Ideal to take on trips. Use it to remove spiders ,wasps and bugs around your home, office, workshop or campsite.Long enough to swat flies even though in a long distance. ✦SIMPLE,SAFE & SANITARY✦Plastic manual fly swatter was made of Non-toxic and Odorless Plastic, no batteries needed, different with traditional pesticides, and they are safe for your families, also no pollution to environment. ✦BRIGHT COLOR✦The colors are fun, too - make the swatters easy to spot when you need them. Perfect for the parties or any activities. ✦BUY WITH CONFIDENCE✦100% Satisfaction Guaranteed, our product comes with 12 months manufacturer's warranty. We will replace or refund If you have any concerns. If you have any questions about this product by LENKA, contact us by completing and submitting the form below. If you are looking for a specif part number, please include it with your message.